I had the pleasure of meeting Suzanne Leider R.N., founder of Sarcoma Alliance, early this year. I was immediately drawn toward Suzanne. She was present, open, and genuine. During our first meeting I learned a lot about Sarcoma Alliance, a non-profit whose mission is to guide, educate, and support people with sarcoma and their family,friends, and caregivers. 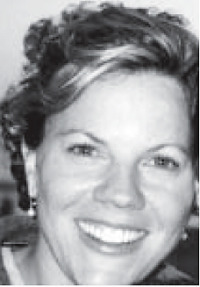 Suzanne was a ten year survivor of synovial cell sarcoma, a rare cancer of the connective tissues, and she was dying. I asked Suzanne if I could interview her and she graciously accepted. This interview was done in late spring only months before Suzanne died. She lived her last days with joy in her home in Napa surrounded by loved ones. Suzanne Leider died August 8, 2002. What are some of the challenges you have faced with your illness? I have been living with synovial sarcoma, a rare cancer of the connective tissues, for almost ten years. My most profound and ongoing challenge has been dealing with loss of health, energy, physical abilities, independence, innocence-and how to grieve for those losses in order to remain open to life. In dealing with such tremendous loss at the tender age of twenty five, I felt disconnected from my cohort group. No longer was I the young adult full of hope and plans for the future. I was an anomaly on a very different path. This sense of disconnection, along with the rarity of my illness, stirred in me feelings of isolation, feelings that did not subside until I met another young and vibrant woman with the same disease and with similar struggles. The other challenge I’ve come to know is that the challenges don’t stop; they are not things to conquer, overcome, or forget, but issues that need to be continually addressed, explored, and honored. These are but a few of the challenges I’ve faced. It would take an entire book to discuss them all! What spiritual healing paths have you explored? During the early years of my illness I followed the spiritual path of nature. By this I mean I hiked frequently on Mt. Tamalpais and trekked and backpacked in such places as Yosemite. I found peacefulness, a deep sense of spirituality by being in nature. As my disease progressed I had a very brief and profound experience with a Jewish mystic whose teachings I practice to this day. Practicing Judaism, especially the mystical aspects of the religion, has brought me a sense of the sacred. During the last four years I have explored yoga, meditation and pranayama, practices that have helped me integrate peace and a sense of well-being into my daily life. I have read many books on Buddhism as well and consider Pema Chödrön’s writing on the practice of tonglen (for cultivating compassion) to be a great path for me. How has your connection with the Sacred changed, if at all, since you were diagnosed with sarcoma? My connection to the Sacred, to God, has grown much stronger since my diagnosis of sarcoma. My illness has created more urgency and a need to be with God that I did not feel prior to my diagnosis. I have found that I am drawn to faith, to a belief that God will hold me now more than ever. What is the most important thing that you can tell someone who is newly diagnosed with a life-threatening illness? diagnosis can bring unexpected gifts if you let it; you are not your diagnosis. What is important for loved ones to know about your living with a life-threatening illness? How would you suggest loved ones be the best support for you? One of the things I have tried to convey to my loved ones over the years is that I love life and that what is happening to me is not a tragedy. I think loved ones worry terribly about pain and suffering and how unfair the situation is. I try to communicate that even though I have pain and do suffer, I also experience tremendous amounts of joy and satisfaction in my life. I also remind them that I am still the same person and would like to be treated as such. For example, I do not want them to avoid issues or topics that they think might upset me. Feeling like I was being treated with kid gloves would upset me more. I have found that one of the key ways that loved ones can support me is by taking care of themselves. Another way is by remaining open and calm and being present for me. Trusting me to make the decisions that are right for me is a key element of support. Healing to me is a sense of peace and wholeness, a feeling of well-being. For me, healing is a product of being in right relationship with myself, with others, and with God. How have you experienced healing? I have experienced healing by forgiving myself for having this disease and for bringing this disease into the lives of my loved ones. I am learning to surrender, simply being present with the changes I am experiencing, noticing them, but not jumping to fix them or to assign meaning to them this has been enormously healing. Spending time with loved ones and expressing how I feel about them is healing. Ultimately, being gentle with my whole self – body, mind, and spirit – is the essence of healing for me.